Early in the morning and fifty or so kilometers from Paris, the green fields roll gently in the early morning mist. The sun rises slowly to the east. It’s as if I’m watching a French film, its deliberate meditative pace, through the lozenge window of my tiny black Renault Twingo. In the middle of the green fields, stucco and tile farmhouses interrupt the eye, draw it in and make you wonder about the length of time these places have been here. You feel the age of the land, its harmony. Then the outskirts of Paris ease in—first a neighborhood of mid sized buildings, then corporations that dot the suburbs, big buildings. Until suddenly there it is, the sign “Paris-Centre”. The traffic slows and narrows, though still in 6 lanes. 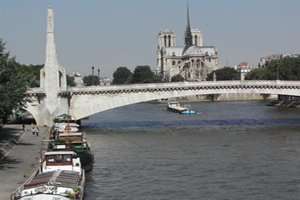 A tunnel—and Paris rises beyond it, the Siene running along the highway urging you on. It was a long way to get here—literally and metaphorically. The day and night before I crossed southern Sweden, a half of Denmark, and a major part of Germany—Hambourg, Hannover, Douseldorf to, finally, Luxemberg where I saw my first grape vines and I smiled because I knew France was near. I began the day by leaving Lund at 7AM and got to about 100kilometers of Paris by midnight or so. The key to my apartment was being held in a café (very French) and I tried frantically to call on my cell but I was doing something wrong and couldn’t get through. I knew they’d be closed by the time I entered France—besides, I didn’t want to tackle streets and things in the dark without the guarantee of a bed to lay my head. So I did what I would have done 30 or years ago—I’m glad I recalled—I slept in a truck stop in my car. I slept through the night and awakened a bit stiff at 5AM, washed up, drank a double espresso and began the journey into Paris. I don’t know, maybe I’m overly romantic, but when I saw “Paris-Centre,” I got emotional. Perhaps it was simply that I was working really hard to erase all images I have of Paris, all of which come from literature and film, and of course, my family, mostly my mother. The emotions escalated when I realized that the entry to Paris, the way I came in, is almost identical to the entrance to Buenos Aires. Even the first signs of the city immediately catapulted me to Buenos Aires. I was in two places at once—a very Borgesian experience; or to put it in the tradition of contemporary French philosophy: since I’m here, I was always who I am, always being the other I find now. I have always been here, though I was seeing it for the very first time. I was seeing myself in this light for the first time. This implies that psychologically I had been ready for this experience and that all my experiences leading to this moment had prepared me for my first visit to Paris. I was always already in Paris. 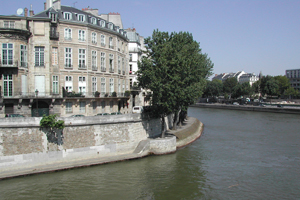 I hugged the Seine and drove ever so slowly. The pay off for sleeping in the car was coming into a city yet to awaken—this awakened me. I drove carefully, deliberately, my eyes on the classic beauty, the barges, the old buildings, the narrow streets—and the street signs and my map. That’s how I did it. I’d go so far, stop and look at my map; memorize routes and street names, calculating how much time I’d travel to get to my next stop. Then do this again. Within ten minutes of being in the city, I found the Restaurant Retirement, which held my keys. Unbelievably, they were cleaning and I had to wait only five minutes for the keys, held by the manager. She gave me an envelop with my name on it and I opened it. In it, the keys and the address—no directions. Very French! This, too, made me feel as if I was in Argentina—same minimalist approach to everything, letting one fend for himself. Argentina and France share a similar aesthetic in that the native wants the tourist to interpret signs, thus moving him or her towards becoming a visitor, one who is not there to merely look at sites, but rather, one who is there to be affected by the place, its people and history. I got some directions, but I knew, between their French-English and my English-French, that I wasn’t being told the entire story. Back to the map. Immediately I found the street on the map, but I had to go through a series of circles, “DO NOT ENTER” circumlocutions until, a half hour later, I found the place. 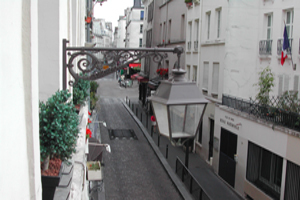 I lived on Rue Mouffetard,a street in the Ve arrondissement, near the Sorbonne. It is a quiet, narrow little area; it’s very neighborly, a real community, which is what I like. 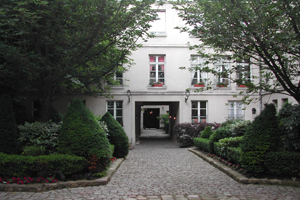 I was on the first floor of a beautiful building with a wonderful interior garden—something you read about or find in French movies. Outside, next door, a Creperie, of course; and down the block, about 50 meters, a small grocery store from which I purchased eggs, juice and, yes, bread and wine. And right in front of the little grocery store, a wonderful circle, all cobblestone, lined with cafes. Right around me are streets such as Diderot, Pascal, Descartes. 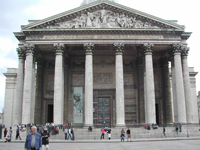 When I arrived at my studio apartment, obtained through Parissimo, specializing in short term rentals, the city was barely awakening. I could hear the voices outside from my opened French balcony windows. I could also hear the birds and the pigeons. It was overcast and cool, so good for walking. Numerous church bells sang, calling. And I felt very, very lucky. Very fortunate, indeed.